Featured Products are available starting on our Growth Plan. This feature allows you to promote products on a dedicated upsell area on your store, allowing visitors to easily click through to certain products and driving sales. You can also decide the number of products to show for either logic choice. The Manual Selection option allows you to pick the exact products to show in this upsell area. The difference is Basic only shows text, while Photos will display the product image to the left (see above screenshot). This screen also allows you to configure the Title & Title Font Size, in addition to displaying the review count. Once you're happy with the changes, click the "Save" button at the bottom. 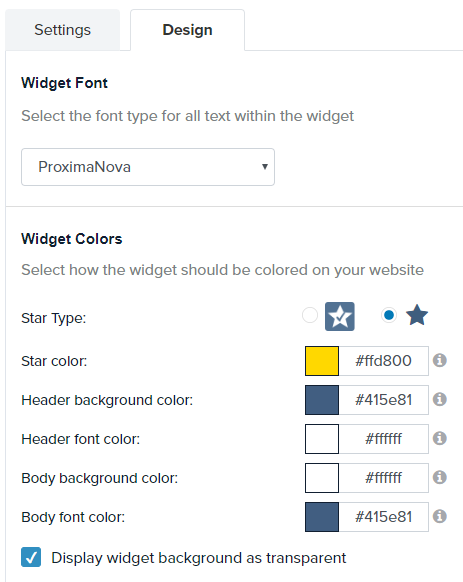 If you made a mistake with a color option, you can always revert back to the default by clicking the "Reset to Default" button. After all settings are selected, simply copy & paste the below code onto your page where you would like it to appear. That's it, you're all set. 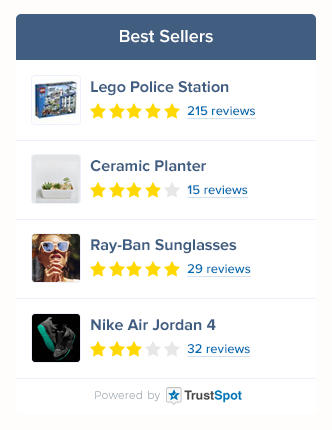 The Widget will continually update as new reviews come in based on your settings.